My love to electronics has started from my childhood. And if you ask me about: “What was your favorite toy in childhood?”, then I answer: “Most likely it was a soldering iron”. In that time I only had a minimal basic knowledge in electronics. But to understand that a circuit is broken due to a faulty resistor or transistor was not a big problem for me. 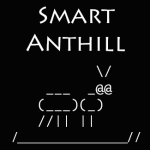 This entry was posted in SmartAnthill and tagged 1-wire, Arduino, CAN, climate control, home automation, owfs, SmartAnthill on December 27, 2013 by Ivan Kravets.